Let me explain something. I'm color-blind, okay? I'm a strong deutan. This means I find it difficult to tell the difference between reds and greens or purples and blues. [unrelated]Certain shades of red look orange to me as well[/unrelated]. What does this have to do with Scratch? Well, the block palettes! To me, in the current version (2.0) there is no difference between Looks and Motion blocks! All the time, when I make anything in Scratch, if I'm looking for [e.g. ]the “change x by ()” block[/e.g. ], I almost always go to the Looks palette before realizing I'm in the wrong place! My suggestion is to make just a slight color change to the palettes, so that the individual colors are obviously different and more color-blind friendly. I'm sure there are other people with color blindness that have similar problems (maybe different color pairs from me look identical) so this would not just help me. Support if you do have these problems or if you think that this color change would be helpful for those of us who do have these problems. Bump, no one responded. At least tell me why you don't support! 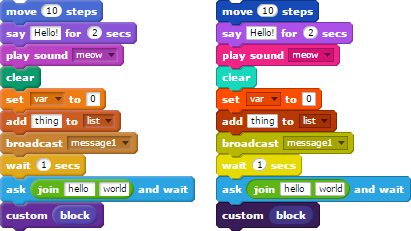 Scratch supports changing the block colours by shift-clicking Edit, but unfortunately they're not permanent. Support to make block colour changes permanent (for the user) and have some presets (default, and some colourblind-friendly modes), and to make it available on the edit menu without having to shift-click. How much better are the colours on the right of this? Better, but the difference could still be more pronounced. When I say I'm a strong deutan, emphasis on strong. Excellent color change for the sound and other blocks, though. Scratch supports changing the block colours by shift-clicking Edit, but unfortunately they're not permanent. Yeah, I know of that feature, but having to re-implement the color scheme every time Scratch starts up is pain so I only do it for large scale projects that I'll be working on for long periods at a time. …and have some presets (default, and some colourblind-friendly modes), and to make it available on the edit menu without having to shift-click. Why have presets for colorblindness when you can make the colorblind-friendly scheme the default? This is a good idea (I suggest you suggest it in a different topic) but I think the default color scheme needs to be more colorblind-friendly in the first place. Again, would help a lot! Events and control have already been mentioned, but I've just noticed how similar operators and pen look too, at least to me. I think we could do with keeping most block colours as they are, although this topic suggests we should change the blues and purples a bit. Thanks for shouting me out… It's not just the motion and looks though. I want the colors to be friendly for all forms of colorblindness, not just deutaneropia. There are other forms where shades are difficult to distinguish (hint: pen and operators) and there are forms where other sets of colors are difficult. It's quite difficult to make colours distinguishable to all forms of colour blindness; I support making it more colour-blind friendly, but if you still can't see it, have other presets. I think this should be OK but are variables and events too similar here? Maybe I should make variables closer to lists since they're in the same category. It would be good if some people with other forms of colourblindness saw this. Does anyone here happen to know anyone else who has it? That color scheme is (almost) perfect for my eyes, although I agree that the events and variables are a little too similar. The only person I know with colorblindness other than me is my grandfather but he has the same kind of colorblindness as I do. Seriously though, that color scheme is really good. I see your point. In that case, maybe have the current scheme as default but (in your account preferences maybe or in the edit menu) make color changes permanent for that account and have presets for every type of colorblindness. The problem with that is that it hurts your eyes if you aren't colorblind. There's a save/load option now for saving/loading your own colorschemes. My signature is kumquat proof. Shift click the edit menu, then go to edit block colors. To the left of the category of blocks, there's two buttons; save and load. for various forms of colorblindness. That, at least, would be an improvement, but changing the current default scheme would be ideal. Which ones? I find them all OK. I think instead of memorizing by color, your weak point, do it by the words.